We provide our customers significant advantage based on our unique innovation, the lightweight high performance "SNAPPER" current collector. The SNAPPER is patented technology for lead acid batteries offering the advantage of high energy density, high power density, fast charging capability, extended lifecycle, and most importantly it is price competitive with the old, established batteries. The lead acid batteries with SNAPPERs offer the following benefits compared to conventional lead acid batteries. EVT Power provides a new game changer solution to the growing Micro-Hybrid, Electric Vehicle market opportunity and alternative energy storage by significantly increasing the conventional lead acid battery performance without losing its cost benefit. EVT Power technology featured battery is well suited for the emerging market with affordable cost and excellent performance. 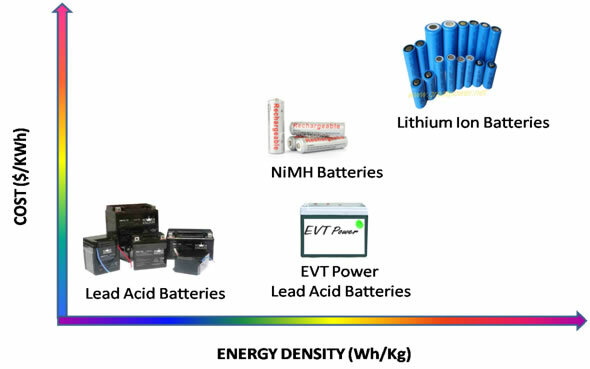 The following graph positions EVT Power among alternative battery technologies. A battery with EVT Power’s new technology components will soon deliver 60% of lithium ion battery performance (energy density) at only 20% of lithium ion battery' price. Our breakthrough lithium-based implementation (not depicted here but is available upon request) will push energy density well past presently available capacity rating for lithium ion batteries up to 50 %.